It’s become the cinematic equivalent of the old “chicken or the egg” question- Who shot first? Han Solo or Greedo the bounty hunter? It’s a question that has been causing much debate and controversy within fans of George Lucas’ original Star Wars trilogy and some concern among film historians and preservationists ever since the theatrical release of the original Star Wars films in early 1997 under the guise of new “Special Editions” with new, previously unseen material and new special effect shots added in. It’s not unusual for films to have scenes added for special edition releases on DVDs and before that laser disc. Many favorite science-fiction films like Blade Runner and Highlander have benefited from this, with additional or reedited footage fleshing out story points or characterization. In many cases it has been done to bring the film back to the director’s original vision from however it might have been mutated by studio demands or politics. In some cases, such as Stanley Kubrick’s Spartacus, cuts were made due to overly strict censorship. The mid-1990s restoration of Kubrick’s 1960 epic reinstated a scene between Laurence Olivier and Tony Curtis that had been originally excised by censors for its homosexual overtones. James Cameron’s restoration of his film The Abyss raised it from an underwater action adventure to a character drama that doubled as geopolitical commentary. Most recently Peter Jackson’s Lord of the Rings trilogy has been released on DVD in both their theatrical versions and “Extended Editions” which have restored approximately 40 minutes of new material per film. Unfortunately, many of the changes Lucas made to his three films seem arbitrary and in some cases, as we will see, undermine the films’ dramatic structure. 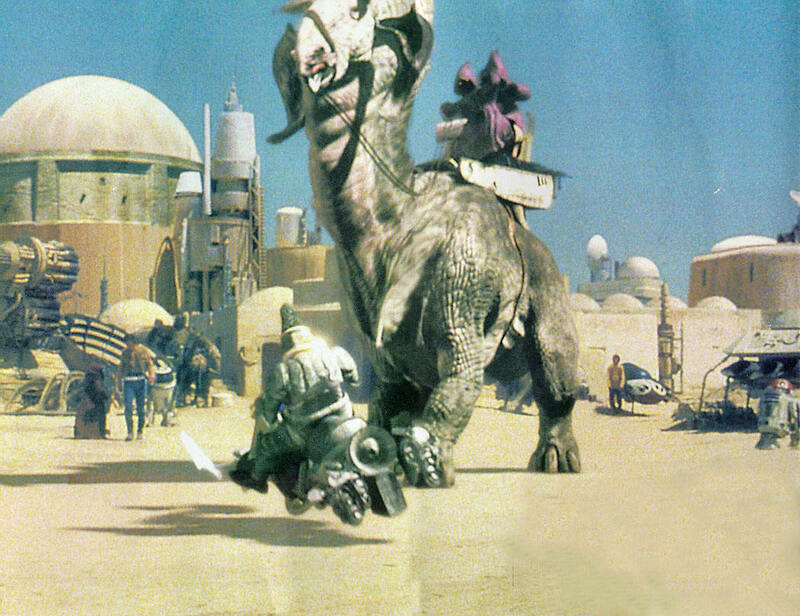 Originally Star Wars’ Mos Eisley spaceport was rather unimpressive as a city, befitting of Luke Skywalker’s complaints that his home planet of Tattoine “was the furthest planet from the bright center of the galaxy.” However, in Lucas’s reimaged “Special Edition” Mos Eisley has been expanded through the use of computer generated cityscapes and new imagery inserted into existing footage, creating a much larger metropolitan environment. Computer generated creatures inhabit the backgrounds of several scenes, but are animated to such a degree that they call attention away from the foreground action. The end result is Mos Eisley now has all the hustle and bustle of downtown Manhattan and Luke sounds like a kid complaining about living less than an hour away in the Jersey suburbs. Of course the most glaring alteration to Star Wars is the now infamous “Greedo shoots first” scene. As even most non-die hard Star Wars fans know by now, Lucas re-edited the scene where originally an alien bounty hunter confronts smuggler Han Solo, only to be shot down in cold blood by the smuggler. In the new version of the scene, Lucas now has Greedo shooting at Han first, with Han returning fire in self-defense. Han Solo and Greedo moments before their fateful confrontation. But did Han fire in self-defense? The problem with this scene is two fold. First, the reedited scene uses alternate shots than the original scene that are just not as well composed as the ones used in the original version. In addition, the way the scene is staged leaves us with absurdity of Greedo firing at Han at point blank range and missing by at least a foot. The second and more damaging problem with this change is what it does to Han’s character arc. 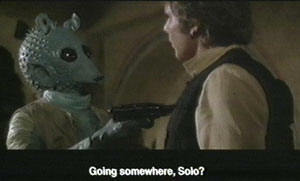 With Han shooting Greedo, basically in cold-blood, his character is established as self-centered and somewhat ruthless. That makes his timely reappearance at the end of the film, with his own interests set aside for a greater good, much more dramatic. That growth of character is lost by setting Han up as a more sympathetic character at the beginning of the film. At the time, Lucas said the change was made because he didn’t want Han to appear so ruthless. This seems an odd statement from someone who claimed to be heavily influenced by the writings of Joseph Campbell and his study of myth when creating his fictional universe. What’s even more puzzling is a statement he made at a recent appearance at UCLA where he claimed that Greedo was always supposed to shoot first and that the original version was “an editing error!” Not many fans believe that claim. The other two original Star Wars films, The Empire Strikes Back and Return of the Jedi, have also had extra material added to their detriment. Empire’s Cloud City has numerous windows digitally inserted into shots. Unfortunately, by visually opening up these sets, they loose the feeling of claustrophobia that contributes to the tension felt as the heroes try to free Han from the clutches of the bounty hunter Boba Fett. Return of the Jedi has the musical numbers in Jabba the Hutt’s palace and the ending celebration replaced with no music. Unfortunately, these were rather poorly conceived ideas to begin with and no amount of tinkering could save them. There’s no denying that visually the new material added was top notch. So much so that new shots of gracefully swooping space ships wind up calling attention to the original, more static shots. But with the speed that visual effects technology moves forward, even some of these newer shots already pale in comparison to what can be done today. This may have been a contributing factor to the numerous rumors that are circulating that Lucas is working on an “Ultimate Edition” of the films for their DVD release. In an indirect way, Lucas has emulated one of his favorite directors Akira Kurosawa and has created his own Rashomon. In that classic film Kurosawa presented one incident from various participants’ viewpoints, leaving it to the audience to decide which version, if any, was what actually happened. Older movie fans who first saw Star Wars prior to 1997 have one set of memories of the films, while those who grew up after the release of the “Special Editions” remember a different film. The true tragedy of this, is that George Lucas has stated time and again that the “Special Editions” are closer to his vision of the films and that the original versions will never been seen again. This is unfortunate for a variety of reasons. First, as outlined above, the changes made are actually harmful to the overall narrative. Also, at the time of their release, these films were the absolute state of the art in terms of special effects technology. In some instances, the films were pushing the boundaries of what could be done visually and inventing new ways of doing it. Star Wars would win an Oscar for its visual effects while Empire and Return would be awarded Special Achievement Oscars for their visual effects. By not allowing them to be seen in the state they were originally produced, Lucas is withholding an important document on the history of film. It’s also an insult to the technicians who worked so hard to make the films what they were. What makes this attitude even more puzzling, and some would say hypocritical, is that George Lucas has frequently donated money to various film restoration and preservation projects. It seems that his own past work is above such historical preservation and consideration however. Star Wars also has had an enormous impact on the pop culture. When first released, lines blocks long formed at cinemas of people anxious to watch, and in may cases rewatch, this film. (Hard to believe that studio 20th Century Fox was actually banking on Damnation Alley with George Peppard to be their big summer film rather than Star Wars.) In 1989 the film was one of the first 25 titles placed on the National Film Registry by the Library of Congress’ Film Preservation Board. In 1998, the movie was named to the fifteenth spot on the American Film Institute’s list of the 100 Best American films. However, these things seem to mean nothing to George Lucas. In October 2003 the City of the Angels Film Festival in Los Angeles held a screening series entitled “Century of Cinema” which showcased 13 films that helped to define, shape or change film. The program included such films as Lang’s Metropolis (1927), Disney’s Snow White and the Seven Dwarves (1937), de Sica’s The Bicycle Thief (1949), Nichols’ The Graduate and Tarantino’s Pulp Fiction. The one film that was picked to represent the entire 1970s was Star Wars, beating out other films like Annie Hall (to which it lost the Best Picture Oscar to), the Godfather Parts I and II, Apocalypse Now and a myriad of others. Unfortunately, Lucas would not allow the original version of Star Wars to screen, only releasing a print of the “Special Edition.” It’s a shame, as the “Special Edition” of Star Wars, with its rethink of the Han/Greedo confrontation and jazzed up special effects is a different film that the original and represents George Lucas at a different point in his career. It’s hard to believe that these are the actions of the same man who developed The Young Indiana Jones Chronicles television series as a vehicle to present history to younger audiences. Now I’m no big believer in internet petitions. These days, anyone with an ax to grind and some bandwidth can start their own petition. And I’m sure that the objects of such petitions give them as little consideration as they probably deserve. However, there is one petition site that has actually been gaining some notice and that’s at www.originaltrilogy.com. With over 47,000 signatures behind it, the petition respectfully asks George Lucas to reconsider his decision to not make the original edits of the classic Star Wars trilogy available on DVD. Several home theater web sites including DVDFile, The Digital Bits, Home Theatre Online Community, and The Letterbox and Widescreen Advocacy Page have also endorsed the petition. And now I’d like to add Film Buff On Line to that list. I’d like to ask everyone who reads this to head over to www.originaltrilogy.com and add your name to thousands of other film fans who have already signed the petition. If you have any interest in cinema history and film preservation, I think you’ll understand why it is important that the original Star Wars trilogy be available for people to both enjoy and study in years to come. If he cares so much about filmmaking, then why won’t Lucas allow the original versions to be released? It was the original versions that broke ground, created new technologies and influenced an entire new generation of future filmmakers. It was the original versions that were awarded honors by the Motion Picture Academy of Arts and Sciences. It was the original version of Star Wars that was named to the National Film Registry. If Lucas cares so much about art, then why is he releasing the version that significantly diminishes Han Solo’s character arc? If he cares so much about art why is the “Special Edition” version of The Empire Strikes Back, with its inclusion of a scream that turns Luke’s stoic and heroic self-sacrifice into an act of confused cowardice, being released? From how it looks to me, I really don’t think Lucas cares a bit about filmmaking and art. Is he embarrassed by the success of his earlier films and the amount of adoration they have received? Is he so obsessed with the technical side of movie making that he feels compelled to tinker with them so they don’t look “dated” next to the newer prequel trilogy? Do they keep touching up da Vinci’s Mona Lisa to update her wardrobe every few years, so she doesn’t look dated? Sadly Lucas seems to refuse to recognize the importance of the original versions of his films. Whatever his true intentions, his disregard for his films as they originally appeared is something I personally can not support. The original versions have been out for years and are still available for those who do a little hunting. I have the films in a very nice VHS box set. But given the degradability of videotape, I may look into purchasing a laserdisc player and one of the releases of the original films on disc. I will not be purchasing the new DVD set when it is released this coming fall. It is not the product that I want, so I will not spend my money on it, anymore I would buy a DVD of Gigli, Roseanne Barr’s She-Devil, or some other movie that I didn’t think was worth plunking down my hard earned cash for. 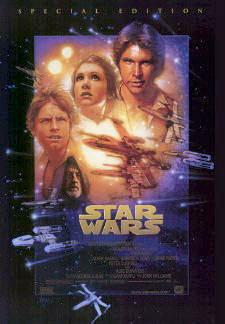 Hopefully, someday there will be a version of the original Star Wars trilogy on DVD that I will want to pay money for. A film fan since he first saw that Rebel Blockade Runner fleeing the massive Imperial Star Destroyer at the tender age of 8 and a veteran freelance journalist with twenty years experience writing about film and pop culture. Should We Be Worried About Who Is Converting STAR WARS To 3D?